we have reduced PO4-P from 3.53 mg/l to 0.095 mg/l (target is less than 0.2mg/l). the algae have reduced the nitrate concentration from 11.7 mg/l to 0.36 (which is a 97% reduction). It removes a variety of pharmaceutical contaminants. 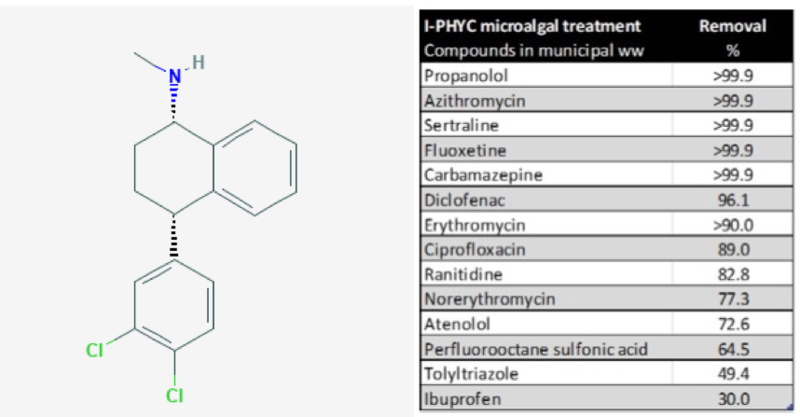 From high blood pressure medicine, antibiotics to anti-depressants, microalgae are very efficient at removing active pharmaceutical ingredients (API). Many of these compounds are removed completely. This is a fantastic start and we look forward to sharing more results once the plant is fully commissioned and the algal concentration is up to full strength.